In the summer of 1938, war loomed on the world’s horizon. Though fighting had not yet touched Britain, the government began preemptive plans to evacuate the cities. The Anderson Committee divided the country into “evacuation,” “neutral” and “reception” zones, and established priority evacuees: school children and teachers, mothers and young children, pregnant women, and incapacitated adults. At the time, London was as yet out of reach of the German Luftwaffe; however, evacuation plans progressed, rehearsals were held, and additional rural camps were set up for evacuees. By 1939, it became increasingly clear that war was on Britain’s doorstep, and local evacuation suddenly seemed an insufficient measure. In June of 1940, France crumbled under relentless German attack. The Germans then set their sights on Britain, starting with air assaults and progressing to Blitz and bombing of British cities by September of the same year. The British government began to fear for the country’s survival in the case of an all-out invasion; thus, suggestions began to surface for a large-scale overseas evacuation. While the suggestion was initially rejected, the government soon began to look to Commonwealth nations such as Australia, South Africa, and Canada and also the United States as safer havens – a way of survival for some, even if Britain was invaded. Thus plans were developed with the goal of evacuating 1 million children to British Dominions overseas. The first “guest children” sent abroad were those of the upper class families. Personal efforts were made to send children to family or friends in Canada or America. In some cases, parents from an entire school combined efforts in private arrangements to send the whole group of children abroad. Eventually, however, the public began to demand government assistance for those less fortunate. 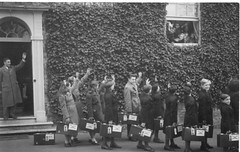 The possibility of an eminent Nazi invasion had parents clamouring to send their children to safer shores, while private groups in America and the other Dominions were inspired to offer a haven to Britain’s children. In order to facilitate this emigration, the government established the Children’s Overseas Reception Board (CORB) in May of 1940. The CORB was responsible for organizing this overseas evacuation, and applications began pouring in from all over the country. Rather than processing the applications on a first-come-first-served basis, CORB placed greater priority on some children than others. It’s unclear exactly how selections were made; however, the press was soon accusing CORB of giving preferential treatment to children of the wealthy. Many more applications were received than the government was able to move, and ultimately, many of the children who were sent abroad were indeed children of wealth with contacts overseas. The CORB process was a slow one, and in fact, far more children were sent abroad through private arrangements. An estimated 13,000 children were sent abroad by parents with the means to do so. While CORB received 210,000 applications by the time the scheme was ended, it’s estimated that a mere 3,300 were actually sent to the Dominions by the organisation. Evacuees were primarily sent to the United States and Canada, since the trans-Atlantic passage was relatively short. Most, however, were sent to Canada, as immigration between England and Canada was more easily accomplished. Of course, some children had families in the other Dominions, so a number did end up in Australia, South Africa, New Zealand and the Caribbean as well. In 1944, the tide of the war had shifted, and Britain decided to bring its children home. Troopships brought American and Canadian soldiers to their home shores and returned with British children. Families were reunited, and Britain set out on the path to rebuilding the nation. Emigration had sharply declined over the course of the First World War. Capitalizing on the potential of Britons wanting to emigrate from post-war England, both Canada and Australia began concerted efforts to encourage renewed immigration. Owing to these efforts, migration gradually increased between 1919 and 1920. During this time, the British government began implementing schemes of its own – though often in collaboration with the various colonies. A couple of programs were instituted to not only encourage emigration to Australia and Canada, but also to New Zealand, and South Africa as well. The 1919 Overseas Settlement Scheme was passed to assist discharged soldiers returning home from the Great War. The scheme offered free passage to ex-service men and women and their dependents. This scheme lasted until the end of 1922, and over its duration, over 86,000 migrants were provided assistance. Of this 86,000, 26,560 went to Canada, 34,750 went to Australia, 12,890 went to New Zealand, 5,890 to South Africa, and nearly 3000 ended up in other parts of the Empire. In Australia, just over 24 million acres was allocated to the settlement scheme. Approximately 23,000 farms were established across the country, and by June of 1924, 23,367 soldiers and sailors had emigrated and settled on the farms. This scheme enabled greater development of land that had been previously uninhabited in territories throughout Victoria, New South Wales, Queensland, and South Australia. New Zealand saw a dramatic shortage of farm labourers after the loss of 17,000 men in the war. In addition to aiding ex-service men, various private sectors in New Zealand also instituted juvenile immigration schemes. The Flock House Scheme, for example, was initiated in honour of the British Navy and Mercantile Marines, and provided homes for the children of sailors who had been killed during the war. Boys received instruction in agriculture, while the girls were trained in domestic and industrial occupations. Through this scheme and others, approximately 2600 children were brought to New Zealand. In 1922, the Overseas Settlement Scheme was expanded to provide assistance to any “suitable persons” from the general public who might want to emigrate. This scheme was dubbed the Empire Settlement Act. This act allowed the British government to collaborate with its Dominion governments, as well as with private organizations and public authorities, to develop emigration schemes. Under this act, married couples, single farm laborers and teenagers between the ages of 14 and 17 were given free passage, and occasionally, training opportunities. In exchange for passage, the emigrants were expected to settle and remain on the land. 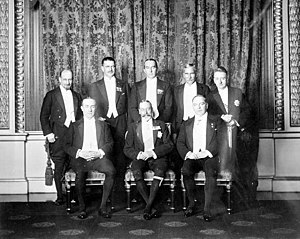 A variety of public and private schemes were instituted under this act, including the “3000 Families Scheme” and the “Dominion-Provincial Land Settlement Scheme” in Canada, and various Australian settlement schemes initiated by Dr. Barnardo’s, the Big Brother movement, and others. Over its duration, the Empire Settlement Act provided assistance to 212,000 immigrants to Australia, and another 130,000 immigrants to Canada. Was ‘being Scottish’ more important in New Zealand than in Scotland? Between 1815 and 1850, population growth was soaring throughout Europe. Though the Industrial Revolution was making the continent wealthier overall, jobs were scarce and many were forced to look toward the New World for economic survival. During the first half of the century, over 800,000 European immigrants left their homes and settled throughout Canada. Seeing as the Industrial Revolution started in England, nearly 60% of these immigrants came from Britain. Immigrants came from other countries as well. Americans and Chinese came looking for gold. Many Irish came to escape the great Potato famine. The British were the first to set out for Canada, however, and were the largest cultural group at the end of the migration. This Great Migration was spurred by a number of factors. Obviously, the Industrial Revolution was an overarching factor; however, individual motivations and reasons for leaving varied greatly. Lower classes were obviously facing a severe job shortage. Unemployment was rampant, and the poor felt suppressed by the government. Industrialization was in its infancy and regulations were practically non-existent, so towns were made filthy with soot and fumes. The Irish were facing a unique struggle with the great Potato Famine, and thousands were starving and desperate for a solution. England’s wealthy classes were also looking toward Canada, though for different reasons. Canada was fresh new territory, ripe for the taking. Enormous opportunities existed for new business ventures, and those who could get in early stood to make a fortune. Regardless of why the immigrants left Britain, each was hoping for a chance at a better life. Most felt that the better life they were hoping for would be attainable if they could find a job, enough food to sustain their family, a healthier environment, and a greater voice in their government. Following the promise of cheap or free land in Canada, the immigrants left England with high hopes. They endured expensive, arduous sea voyages, only to have those hopes crushed in many cases. Many arrived sick from the long voyage, and if they were too ill, they were often deported, quarantined, or even simply left to die. Success didn’t come easily to the immigrants. There was opportunity aplenty, but the settlers had to fight for every inch. The climate was harsh, and the British settlers were not prepared for the bitterly cold winters. During certain seasons, insects invaded in force, and caused serious trouble for the newly arrived settlers. Though the immigrants found jobs, education, equality in government representation, freedom of language, and freedom of religion, the path to success wasn’t smooth sailing by any means. In spite of the struggles, many immigrants did succeed, and the British settlers have since made a huge impact on the culture and development of Canada. The English language is the national tongue, thanks to the British immigrants, and many place names and traditions, principles and even religion were brought in with the British settlers of the Great Migration. What was The Great Migration? Thomas Barnardo never intended to settle in England. He set out with grand ambitions to become a missionary in China. As it turned out, however, he found his mission among the destitute and drifting children in the slums of England’s cities. Thomas was born in Dublin, Ireland on July 4th of 1845. He was the second youngest of the five children born to Abigail and John Michaelis Barnardo. John, a furrier by trade, had emigrated from Hamburg to Dublin in the early 1840s – not long before young Thomas was born. Over the course of two marriages, John fathered seventeen children. John’s children were well cared for, and young Thomas began his working life as a store clerk. Before long, however, Thomas converted to Evangelical Christianity. He left his employer and spent much of his time preaching in the slums of Dublin. After a time, Thomas set his mind to becoming a doctor, with the plan of working as a medical missionary with the China Inland Mission. In pursuit of this plan, Thomas moved to England to begin his studies at the London Hospital. He went on to further his studies at colleges in Paris and Edinburg, where he was made a Fellow of the Royal College of Surgeons. Despite his extensive studies, Thomas never earned a doctorate. As he studied in London, he began an evangelical work which made him aware of the plight of homeless, drifting children adrift throughout England’s biggest cities. Barnardo was a powerful speaker, and brought his concerns to the Missionary Conference in 1867. His speech fell on the receptive ears of Lord Shaftsbury and prominent banker, Robert Barclay. They were moved by the plight of England’s homeless children, and offered to support the establishment of homes for these children. Thanks to their support and encouragement, Thomas gave up his plans to move abroad. The first of “Dr. Barnardo’s Homes” opened its doors in 1870 at London’s 18 Stepney Causeway. This first home was the beginning of Barnardo’s life’s work. From this small beginning, his humanitarian reach continued to increase, ever with the goal of feeding, clothing and educating the waifs and strays of England. The youngest children Barnardo received were “boarded out” to families in rural homes. Older girls were trained in useful occupations and housed in industrial training homes. Boys in their upper teenage years were also trained in labor homes before they were given employment in businesses at home, at sea, or abroad. Barnardo’s was one of a number of charities that were actively involved in child migration. The policy was widely accepted at the time, and Barnardo was a prominent figure in enabling child migration in the late 19th century. He primarily worked at placing children in homes throughout Canada, and succeeded in sending over 30,000 children to new homes there. Barnardo went on to establish further institutions, including a convalescent home, a hospital for the very ill, and a rescue home for girls in danger. Barnardo and his wife also converted their Barkingside home into “The Girls’ Village Home,” complete with 66 cottages and a modern steam laundry. Thomas Barnardo succumbed to angina pectoris on September 19th, 1905, and was buried in front of his house in Barkingside. At the time of his death, over 8500 of England’s destitute children were being cared for in his 96 homes. Proving the great value of his work, a national memorial fund was instituted, providing financial support for Barnardo’s work on a permanent basis. The year 1847 was a year of deep tragedy for the nation of Ireland. The first half of the century had seen unprecedented demographic growth, with the population doubling from four to eight million by 1845. Naturally, the structures were not in place for such rapid growth. Agrarian land holdings became smaller as the population expanded. The remaining farms had to maximize their food production to keep up with the demand. Farms that were already in a precarious state financially due to heavy farm tariffs were put completely out of commission when a series of crop failures occurred in the late 1830s. In 1845, problems were compounded further when Europe’s crops were ravaged by a potato blight. Ireland was the hardest hit, and its potato crops were decimated. The resultant famine combined with the precarious economic conditions triggered a huge wave of immigration and subsequent Irish diaspora. Nearly 100,000 boarded ships bound for Canada and the United States. These ships soon became floating coffins as immigrants – already weakened by lack of sustenance – succumbed to disease. On May 17, 1847, the Syria floated into Grosse Isle in Quebec. Sickness had wracked the passengers and 430 were down with fever. In the days that followed, eight more ships pulled into the harbor, each carrying even more typhus victims. A week later, 17 more vessels had arrived, each carrying passengers infected with the fever. At this point, 695 people were already in hospitals and the doctors hardly knew where to put the new arrivals. The number of ships soon reached 30, and over 10,000 immigrants were aboard waiting to be processed through immigration. By the end of May, 40 ships were lined up along the St. Lawrence River, stretching along the banks for two miles. Each ship held passengers affected by typhus and dysentery. Soon 1100 infected passengers were laid out in tents and fever sheds. The island was rapidly overwhelmed, and some immigrants were transferred to Montreal where three long fever sheds had been constructed. Thousands more continued to arrive, and soon there were 22 sheds full of invalids. Troops guarded the area so no one could escape; still, typhus quickly reached epidemic proportions in Montreal. Between 3,500 and 6,000 Irish immigrants died in Montreal’s fever sheds. Other Canadian cities were affected as well. During the summer of 1847, 863 Irish immigrants died in the fever sheds of Toronto, and 2115 more died in New Brunswick. When over 3,000 Irish arrived in Bytown, fever broke out there as well. Fever sheds were erected and the Rideau Canal was shut down to prevent the spread of disease; still, approximately 200 died in quarantine. Kingston also was affected when fever-stricken immigrants passed through and took shelter in immigrant sheds. Some 1,400 immigrants died of fever there. The consequences of the typhus epidemic hit Canada hard. Death and disease took their toll, but the country was also put under serious financial stress as much trade came to a standstill. In time, however, the country began to recover. Today there are 1,230,000 Irish descendants in Canada, many of whom can trace their lineage to the Immigrants of ’47. Throughout the 17th century, the Canadian fur trade was fully controlled by the French. When two French traders, Pierre-Esprit Radisson and Medard de Groseilliers, found that the Hudson’s Bay area was rich with furs, they approached the French government with the idea of setting up a trading post on the Bay. The French Secretary of State was uninterested in backing the scheme, as he opposed exploration and trapping and was trying instead to promote farming in the colonies. Radisson and des Groseilliers were undaunted, and instead approached a group of Massachusetts businessmen with their plans. The businessmen immediate saw the potential and in turn, brought the two Frenchmen to England to raise financing for the venture. In 1668, two ships were commissioned for exploration and trade in Hudson’s Bay. One ship was forced to return home off the coast of Ireland, but the Nonsuch continued on to a successful trading expedition throughout the winter of 1668-1669. When the ship returned to England with its bounty of furs, a number of wealthy English merchants were fully ready to participate in the venture. They formed the Hudson’s Bay Company, and in 1670, the King of England granted them a complete monopoly over the fur trade throughout the lands surrounding Hudson Bay. The fact that those lands did not belong to the crown seemed of little consequence. The Company proceeded to build strategic trading forts along Hudson’s Bay, securing key points at the mouths of rivers. These key ports were valuable not only because they provided access to some of the richest fur country, but the deep-water ports gave Britain a distinct advantage over the French as well. French fur traders had no nearby forts, so they were forced to paddle long distances to reach their sale points in the interior. The British could simply sail their ships straight into the Bay where they could unload their trade goods and load up on furs to bring home. Business was hugely profitable until the late 1740s, as the HBC held a tight monopoly on the fur trade in the region. Naturally, the Company needed hundreds of employees as traders were required for expeditions deep into the Canadian interior. Most of these employees were brought from England and Scotland as indentured servants. Many of these men married native women, and while company policy forbade such unions initially, they soon allowed it and a distinct ethnic group – the Metis – was formed. The 1750s saw the fur trade slow considerably due to the Seven Years War between France and England. When Britain won the war, they took full control of New France and the fur trade. While this should have spelled prosperity for the HBC, competition began to spring up. The North West Company was formed in 1783, spurring fierce competition. No longer could the HBC sit back and wait for the furs to arrive – both companies launched out toward the west to find new sources of fur. Eventually the feud came to an end when the British Government pressed the two companies into a merger. As Canada received more and more settlers, the fur trade went into decline. Since it was soon unrealistic for the HBC to administrate the huge region, the British government negotiated a settlement, transferring the company’s lands to the dominion of Canada. The HBC received a hefty payment and a substantial land grant in payment; however, the company soon diversified its interests. They invested in real estate, marketing and other ventures, and due to their wise investments, the company exists to this day as one of the largest private companies in Canada. Toward the end of the 19th century, Britain was facing significant social and economic trouble. Deprivation, homelessness and neglect were endemic throughout Britain’s overcrowded cities, and child migration emerged as a solution. Britain was in the midst of empire building and the colonies not only provided enormous wealth and resources – they also provided alternative homelands for the unwanted peoples of Britain. Many Britons emigrated throughout this period of history; yet few know of the many thousands of children who were rounded up and sent abroad. Child migrants became the brick and mortar force on which the Empire could continue to expand. Children as young as three were routinely shipped abroad – primarily to Australia and Canada – through government-sanctioned child migration schemes. Charities were even established to support the emigration efforts, as children were gathered from across the UK. They were brought to major British ports such as London, Glasgow, Liverpool, and Southampton where they were given a trunk of clothing and shipped off to their new homes. The vast majority never returned to their homeland. 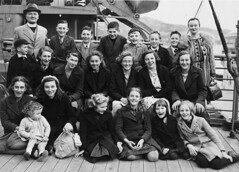 Approximately 100,000 children were sent to Canada, over 7,000 to Australia, and several hundred were shipped to New Zealand and Southern Rhodesia. 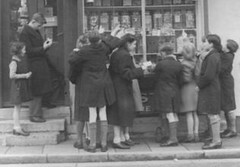 Prior to 1900, the majority of the children were collected from workhouses, city streets and declining rural areas where they were often found destitute and homeless. After the turn of the century the children were sent from orphanages and children’s homes. In some cases, parents were unable to provide for their children and chose to send them abroad with the migration schemes. Many of the children hardly knew what to expect. They faced the future with fear, but also with excitement as in many cases they were simply leaving behind a life of neglect, hunger and hardship. They were promised new sights, new places and the excitement of exploration. They were treated to tea parties and visited by popular entertainers, powerful benefactors, and even by royalty. Each departure was highly publicized to promote the work of the various charities. The children were actually treated very well in Britain and all throughout the voyages. They enjoyed the luxury of passenger liners, sleeping in comfortable cabins, eating hearty meals, and even enjoying games, swimming and schooling on board the ships. Unfortunately, upon arrival in their new homes the children were faced with lands completely foreign and often harsh. In Canada, the children were distributed to rural homes where they lived and worked with farming families. Some fared better than others; however the majority faced hard physical labour in a harsh climate, compounded by the loneliness of being with a family but not being considered part of the family. In Australia the children fared no better. Their smart wardrobes were stripped from them and exchanged for khaki work clothes and bare feet. The children were placed in religious institutions or farming schools where they were subjected to harsh discipline and backbreaking labour. The children were expected to continue in agriculture, and thus received little to no education. At the height of the child migration scheme, as many as 300 children would travel aboard a single ship, chaperoned by staff from their designated charity. The numbers dropped lower and lower as the 20th century progressed; however, the schemes weren’t officially ended until 1967. When the Child Welfare Act was passed in 1948, the child migration schemes came under scrutiny. Investigations were carried out and several of the participating institutions received strong condemnation. The schemes continued, however, for another decade. The last group of child migrants was sent to Australia by air in 1967, and the institutions began to close in the 1970s. As the Napoleonic Wars drew to a close in 1815, British soldiers began returning home. The male population was severely reduced, and those who returned assumed that life would be better. They expected better living conditions and higher wages due to the sacrifices they had made; however, they quickly became disillusioned by conditions at home. Farmers who had been raking in tremendous profits on corn throughout the war saw an immediate and steady decline. To add insult to injury, the farmers were then forced to contribute an ever increasing amount of corn to the poor via the “Poor Laws.” This not only hurt the farmers, but it trickled down to the farm workers as well, who saw their wages reduced dramatically. Conditions deteriorated over the next 15 years. Farm workers were laid off as farmers introduced heavy machinery. Poverty was widespread and workers were angry. It wasn’t long before the “Swing Riots” began. Throughout 1830-31, landowners began receiving threatening letters from the mythical “Captain Swing”. The name was meant to conjure the image of swinging from the gallows, and the intent was to pressure the wealthy land barons into complying with the demands of the laborers. Protests soon followed as workers turned to strikes, arson, mass demonstrations and machine breaking. Anxious to alleviate the suffering of the angry masses, a few people in power conceived the idea of shipping the poor off to Canada. George Wyndham, Earl of Egremont, Reverend Thomas Sockett, and Sir John Colborne believed that the social unrest could be diminished by providing the unemployed with a fresh start in Canada. Thus, the Petworth Project was born. George Wyndham owned much of the land around Petworth (where there was much civil unrest) and provided the financial backing for the project. Thomas Sockett was the principal organizer and founder of the Petworth Emigration Committee. Sockett truly deserves the lion’s share of the credit for the success of the project as he not only chartered the ships, recruited emigrants and oversaw the process, but he carefully monitored the adjustment of the emigrants as they settled into their new life in Canada. From 1832 to 1837, the Petworth Project provided for 1,800 men, women and children to undertake the voyage from Portsmouth, England to Upper Canada. The Emigration Committee instructed the emigrants regarding what they could expect upon reaching Canada, as well as what provisions they would need to bring with them. The Committee provided a list of tools and supplies needed, as well as recommendations for clothing, including warm coats and multiple pairs of stockings in preparation for the biting Canadian winters. Though the intentions of the Emigration Committee weren’t entirely humanitarian, they did, nonetheless provide amply for those making the trek. Conditions on the ships were significantly better than those on other emigrant ships of the day. Upon arriving in Canada, Sir John Colborne ensured the safety of the emigrants as they travelled across the country to their final destinations. Though the trip was by no means easy, it was free and well-paid work was guaranteed at the end of the journey. Very soon, the idea caught on in other regions as well. In fact, in 1834, 31,000 emigrants had made their way to Canada. They came not only from Petworth, but they flooded in from Hampshire and Norfolk, as well as from Munster and Leinster in Ireland. The emigration continued until 1837, when Sir John Colbourne was replaced by Sir Francis Bond Head, who was instead interested in supporting the questionable principles of the “Poor Law” in England.